Katsura is Gintoki's former comrade during the Joi war. Even after the Amanto take-over of Japan, Katsura continues to resist the Amanto, and has amassed a band of followers. His weapon of choice is a metallic grenade. He is a wanted man due to his involvement in terrorist activities against the Bakufu, and is constantly on the run from the Shinsengumi. 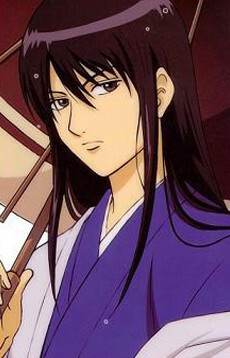 Although his initial methods were originally more violent in nature (for instance, sending a bomb to an Amanto embassy), Katsura has gradually grown to believe that there are people important to him in Edo, and decides that he no longer wants to destroy the country, but believes there should be a way to change it without causing sacrifices. Katsura seems to be highly respected by his followers, and has even been called the "Daybreak of the Joui Faction" by some. When people believed that Katsura had died during the Benizakura arc, even other terrorist groups tried to avenge his death. Since he is a wanted man, Katsura is often seen wearing disguises, although his identity is often still easily found out. One example of a disguise he seems to be fond of is a pirate's costume, complete with an eyepatch (with a skull design) over his left eye and a scar on his right cheek, and using this he calls himself 'Space Captain Katsura'. Katsura seems to possess a rather outdated sense of humour, and sometimes refers to things from a past era, such as when he tried to buy a Famicon when people were queuing up to buy the OwEe (a parody of the Wii). He also seems to have a tendency to make up dramatic stories, which moves others to tears when they hear these stories (except Gintoki). Katsura sometimes works odd jobs (e.g. in Episode 88), to raise money for his terrorist activities. He claims that his heart has started to be moved by Ikumatsu in episode 39 (chapter 55 equivalent of the manga), and held his subsequent interview in her ramen restaurant. In the Japanese version, Gintoki often calls him "Zura." In the first English volume, Gintoki calls him "Casserole," or "Cough syrup." Eventually, the English version changed to Gintoki calling Katsura "Zura." In the Japanese version, Katsura indignantly replies "Not 'Zura'! It's Katsura!" (and will do so anytime he is called something other than his name). In the English version he replies "Not Casserole! It's Katsura!" The Japanese version joke is a pun, since "Katsura" can mean wig in Japanese and "Zura" is slang for the same thing. The English version is also a wordplay since "Katsura" and "Casserole" sound somewhat similar in pronunciation. He has the uncanny ability to know when someone has called him something other than Katsura, even in their head. An example being in Episode 25 as a guest to Gintoki's hotpot dinner. Katsura's birthday is June 26, making him a few months older than Gintoki, and in his twenties. His height is 175 centimeters, and he weighs 56 kilograms. His name is based on the historical Katsura Kogoro.